One Week Friends is over? How can I cope with reality? Ahh, One Week Friends is over… just watched final episode, only 12 episodes are too short. How I wish I could see Fujimiya Kaori-chan forever…I was really looking forward to meeting her every Sunday morning, 9AM PST on crunchyroll, yes, she was the real maiden, real virgin, symbolically, though I’m not sure physically, which doesn’t matter… Totally angel, angelic. I never seen any girl like her in my life, her personality is just crystal pure, no defilement. My school years was when high school girls were getting tacky with gyaru fashion: brown hair, unnatural tanned skin, loose socks, bourgeois European brand bags, and dating support (Enjo-kousai), after college girls were out of the scene after the bubble burst. This Iwasaki Chihiro drawing style of gentleness, cherishability. And Kaori-chan makes obento for you! Yes, she’s a great cook, that variation of obento, if I ever got a handmade obento from a girl in high school, I’d never have moved to America! 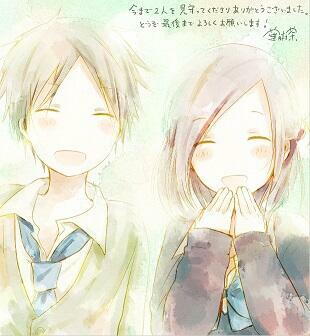 I know Hase is in love with Kaori, yes, by proxy, in 2D world, I also virtually am in love with Kaori-chan. When you are worn out from hard labor, your hands get really worn out from menial tasks, but if that kind of girl says, “Otsukaresama, arigatou (thank you for hard work),” how awesome would that be? And she will hold your hand and put your hand on her cheek, yes, she totally cares about you. Yes, true therapy! Who needs Prozac? Oh yes, this anime has been totally therapeutic to me, totally iyashi (therapy). But losing Kaori-chan, how can I cope with reality? I mean with this harsh and cruel 3D world? I want to see Kaori-chan in an apron. Oh yes, a girl in apron, nothing is more heavenlier than that! That gentle personality, giving you a towel, wraps around your neck when you’re soak and wet from heavy rain. Oh my… I seldom have this experience with anime, this feeling of being loved, but I don’t know why Hase and Kaori-chan are still friends, not moving forward. Obviously, they like each other. I mean, Kaori-chan also feels jealous when Hase is talking to another girl. Just need one step further! 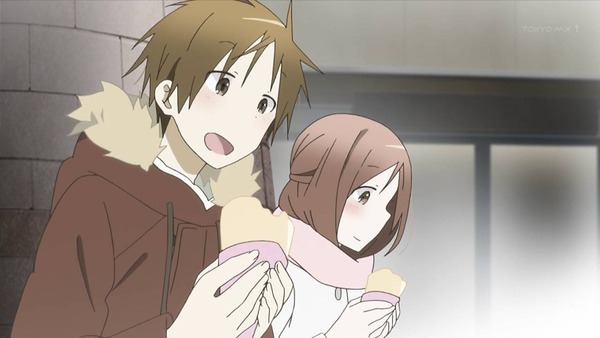 And I totally identify myself with Hase, dating Kaori-chan though officially they aren’t a couple, so I get pleasure of innocent high school romance via Hase, getting connected with Kaori-chan. Kaori-chan is really kawaii, cute-looking too, but no guy hits on her, no competition around her, which is weird, a cute girl like her, but maybe she’s too gentle for dudes to be assertive? Appears fragile or too soft to nikushokukei (carnivorous) dudes? Well, let the meek inherit the earth! Kaori-chan and Hase always go out together, with just two of them, going to karaoke, eating crapes, and so on. How I wish I had that dating experience in high school, I need female friends that I can hang out with, just one female friend is worth a million dude friends. Karaoke with a girl would be so awesome, oh yes, what I seek is a karaoke date that I’ve never done before. How happy would that be! I just don’t know how to live after Kaori-chan is disappearing from 2D world. Every week, she gave me hope to live. That smile, accepting todos, can’t see that anymore? Only 12 eps, that’s just too short. I feel like I just woke up from a wonderful dream, I wish I could stay asleep in bed longer. Going back to harsh reality…where I find myself unwanted and undesired. 12 week friends, instead of one week friends, since my relationship with Kaori-chan only lasted 12 weeks… At least I wish I had 24 weeks, or 2 cours. It just ended too early. 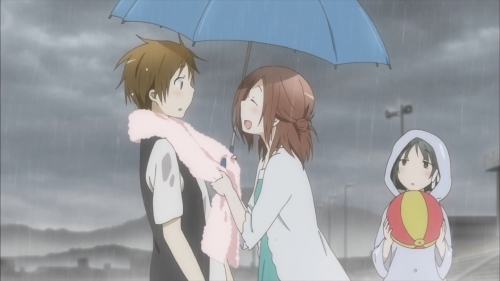 My ideal high school romance…that I re-experienced through this anime. This anime was so adorable because Kaori-chan was so adorable. And that ED song, “Kanade,” ohh, makes me tearful, sad, and lonely, the ideal girl that is unattainable, yes, this is exactly saudade. Previous Post“Date a Live” Movie Announced & “Space Dandy Season 2” Commercial ReleasedNext PostIn the beginning was Pantsu! Usually when a series goes 12-13 episodes, it is because it was cancelled. The manga only goes up to ch 26. Not even any raws out. FML.